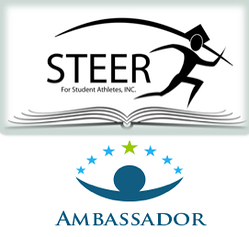 Steer Ambassador - STEER FOR STUDENT ATHLETES INC. Through the STEER Ambassador Program, we hope to gain the support of individuals, families and named sponsors who share the value system that positive engagement with sports can be used to change educational and social outcomes. We would be honored if you would consider becoming a STEER Ambassador and directly sponsoring a new student athlete in our program. 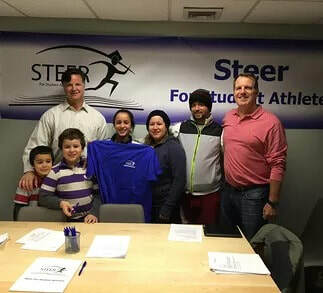 ​By becoming a STEER Ambassador we would identify an individual new student athlete from one of our 5 schools in New York City, Yonkers or Port Chester and provide background, periodic updates and interaction as is desired by the Ambassador to connect with the progress of the student athlete. There are no obligations or specific requirements. The amount of contact would be tailored to the Ambassador and range from simple updates to periodic contacts through Steer staff and Advisors who work with our student athletes as mentors in implementing development plans. ​Tailored direct engagement based on Ambassador individual objectives. Invitations to organizational events and information sharing as desired. Recognition for individual, family or named sponsor on Steer website and relevant communications as approved by Ambassador. *$5,000 per student athlete sponsored. We allocate approximately $2,000 per year in academic, athletic and health service expenses and $3,000 per year in mentorship and other support costs per student athlete. If you are interested in learning more about the STEER Ambassador Program, please submit your name and email in the box below and we will contact you shortly!